This page is being maintained as a resource. It was originally created as a sales listing. I no longer have this lens available for sale. Focus markings: Feet and meters. Feet scale repainted in yellow to improve visibility. Note: 80mm adapter can be removed to use 72mm threaded accessories. Coating: Angênieux High Efficency Coating (same as used on 11.5-138 T2.3 HR and 25-250 T3.5 HR) each surface of each element is multicoated. Looking for a sharp fast 16mm zoom lens but don’t want to spend $7000.00 for a Zeiss 10-100 T2.0? This is the next best thing, the Angênieux 12-120 T2.1 H.E.C. multicoated zoom. Don’t confuse this lens with the old 12-120 T2.5 from the sixties. Although this lens shares the basic mechanical design with the old 12-120 (which is considered by many technicians to be the most reliable 16mm zoom ever made) it uses the same High Efficiency Coating and fluophosphate glass used in the $17,000 Angênieux 11.5-138mm T2.3. The new optics give a maximum aperture of T2.1, Just a sixth of a stop less than the 10-100 T2.0. The sharpness and color rendition are identical to the Zeiss zoom. The 12-120 HEC intercuts perfectly with Ziess superspeed primes. I’ve shot tests to confirm this. 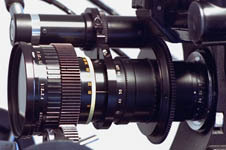 This lens is set up for production work. It is equipped with metal focus and zoom gears, and a bracket to hold a zoom motor (Microforce Heden or CP J-5). It has a stainless steel Arri Bayonet mount, and the front end is adapted to 80mm for compatibility with Arri accessories. All glass surfaces are perfect with no cleaning marks on the coatings, and the exterior of the lens is near-mint. Don’t miss this opportunity to obtain an exceptional example of this rare lens. 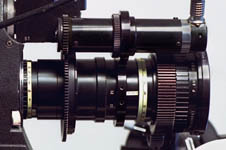 A zoom control system consisting of a CP J-5 motor converted to the Microforce compatible Lemo connector socket, and a CP J-5 handgrip zoom control converted to work as a handgrip on an Arri 16SR, with a Microforce cable is also available.